When I first got pregnant, I took out all my facial piercings. I don’t know why, but I think I thought it would make me a better mum. Or maybe just look like one. I remember when I used to go see the maternal health nurses or paedatricians. I would be sure to cover my tattoos- the tattoos I love ever so much- I didn’t want them to think I was a bad mum. Because, yeah the new mum brain in me thought a) their perception of my parenting skills would be skewed by my tattoos and b) that tattoos somehow had anything to do with my parenting skills. Another thing that really bothered me was the fact that I used to drive a two door barina. I used to walk to all my mothers group events of park a distance away so no one would know. Yep my new mum brain was concerned that my very safe and very functional car might somehow reflect poorly on me as a mum! Being a new mum is tough guys, and it’s okay to feel insecure. You are doing this for the first time, or even the second, and you are learning as you go. The pressure is enormous on you to do the best thing by your child. But here’s the thing, the best thing you can be is you. Whether that’s a face full of piercings, covered in makeup or completely natural, your kids are just happy to see your face. No matter if you drive an SUV or a push bike, they really don’t care. And if you’re covered in tattoos, wearing the latest designer clothes or in your trackies, they won’t even notice. And sure, one day in primary school your child will probably be embarrassed of you. No matter what you do, it’s probably going to happen. All you can do, is be you. If you’re trying to fit this mould of the perfect mum, you know the one we see and even try to portray every day on Instagram or Pinterst, you will stress yourself out. If you want to change, that’s okay too, because parenthood will change you. 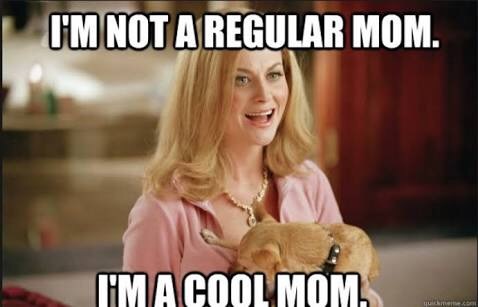 But mums, just be you. It’s really the best you can be, and the best mum you can be. So, what was the biggest change you made when you had your child? And have you changed it back? Things not to say to a pregnant lady: the December/January due date edition!